They do a lot of sleeping. In fact, the big male lying on his back in the shade of a tree, legs-akimbo, front paws floppy, is snoring slightly. Lions might stay in one place for seven hours … nine hours … 15 hours … the time changes according to what each wildlife guide I travel with in Tanzania has witnessed. But with this comes the revelation that lions are mostly benign. For the vast majority of the time, they behave like pussycats. They live and stroll within sight of impala, zebra and wildebeest, herds with young — meals on the hoof. But the days generally pass quietly. There will be a flick for flies, and I see a big male slap an annoying cub that wants to play. But when hungry, they seem to switch on — nose up, ears forward, stare intense, shoulders pumped. Suddenly the power in their fully muscular bodies is evident. They will rise, quickly hunt, kill, eat, and then fall back into reverie. There is the practicality of using every available calorie, of course. But I might interpret that as a kind of respect for the life — for the meal. Death on these savannahs is honoured by a carcass being fully devoured. Nothing is wasted. This is not killing for sport or revenge, but for the practicality of continuing existence. After eating, I see lions flop down on their sides, their distended stomachs spilling onto the ground. When they lie on their backs, their tummies are so full that they fall off their bodies and down to their sides. And they are ubiquitous on wildlife safaris in East Africa. I’ll be as bold as to say this — you will see lions. In Tanzania, around Kilimanjaro, on the Serengeti, in Ngorongoro Crater and Tarangire National Park … I do see lions. Filbert Mnzava and I have decided to leave on our game drive at 6am, when it is chill and dark. Filbert is a guide for Sanctuary Resorts, working at a number of luxury camps, but at this moment at the wheel of an open safari vehicle from Sanctuary Kichakani Serengeti Camp — a mobile camp which packs up and moves with the Great Migration. It’s cloudy but the dawn sun suddenly pokes above the horizon and under the cloud. 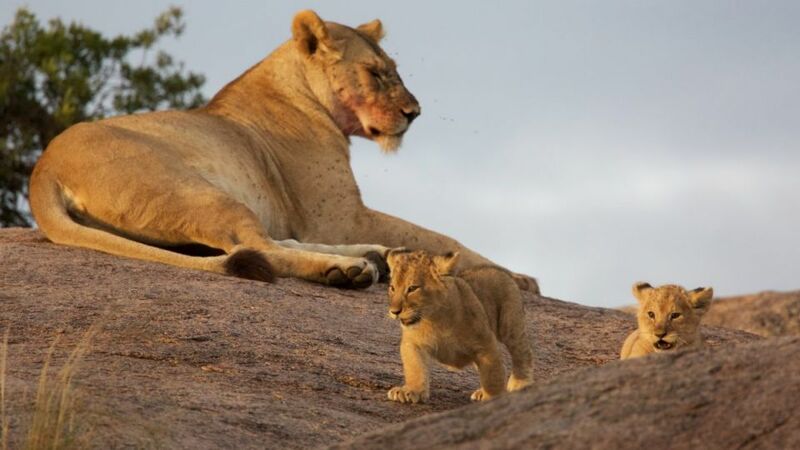 It falls, in a flat slant of red light, on the granite outcrop where a lioness sits as her two small cubs play. The two lark about, tumbling and play fighting. Mother sits, blood bearded from the last meal and peppered with flies, until one cub comes gamboling over. She lies as he climbs over her, before becoming distracted by a twig, then a clean bone, then his brother. Two of the three males, gorged, lay away from what remained of the wildebeest carcass, but the third lay with his face softly against it, paw wrapped around, in mild caress. At Sanctuary Swala in Tarangire National Park, guide Siegfreid Assey had spotted, way off, lions in trees. First, in an old acacia, there is a female lying straddled along a big branch, all four legs dangling. Then there are two mothers and two cubs, high up in a tree, intently watching other cubs still on the ground. In another encounter, we stop near a lion, which casually wanders up to and around the safari vehicle. Then something almost imperceptibly changes in his demeanour and Siggy starts the vehicle and we back away. Often the lions of East Africa act like pussycats, but they should always be treated with respect. 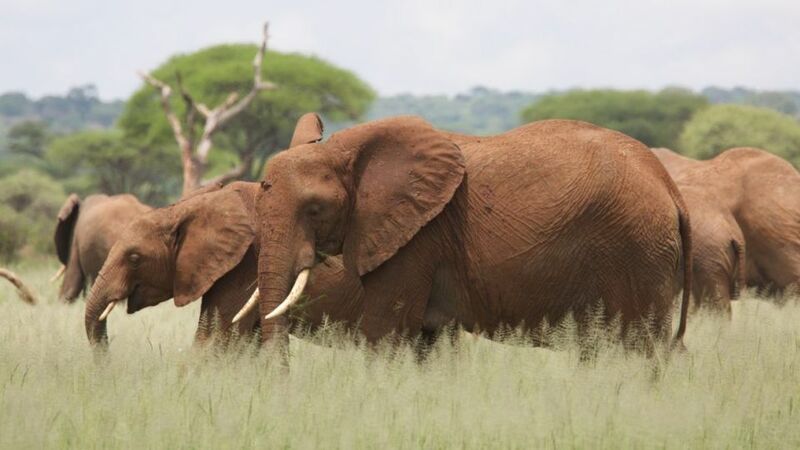 Abercrombie and Kent have wildlife safari programs for Africa, including Tanzania and Kenya. To plan and book, visit Abercrombie & Kent or call 03 9536 1800. South African Airways flies daily to Johannesburg and connects to destinations throughout southern, east and west Africa. South African Airways and travel agents. Stephen Scourfield visited Tanzania courtesy of Abercrombie & Kent.